Project FUEL collects and documents stories – life stories – and then turns them into brilliant visual art to facilitate conversation and raise awareness. Anything but inhibited, the stories don’t have to be extraordinary, just simple life lessons that underline a common human experience. Founded by Deepak Ramola, the initiative focuses exclusively on life stories, lessons, or anecdotes, but don’t limit themselves when it comes to mediums to demonstrate the experiences they have so painstakingly collected. Workshops, theatre, storytelling, blogs, short films, and community events are just some of the many methods through which Project FUEL reaches out to share all that they document. Ramola reminisces about his mother’s brilliance. She was very educated in the traditional sense and he’d often question whether she was lying. When questioned by him, she simply told him about her learning through life – just living, experience and learning from everyday achievements and hindrances. A culmination of this made her a force to be reckoned with and Ramola was amazed by the power of learning through lived experiences. He founded a platform that would be a universal school, of sorts, where people routinely learned important life lessons through one another’s stories – of love, loss, victory, defeat and failure. “I don’t want them to simply just be people’s quotes on the wall,” says Ramola, stressing the importance of passing on wisdom through meaningful experiences. He explains how it could be anything of relevance, a simple realisation or a monumental epiphany, but the important thing is to learn from it and integrate it into our own lives. This ensures that no one is left out; an inclusive concept that invites everyone to share their journeys, and the lessons they imbibe over time. “The only requisite we have is that you should be a living, breathing human being!” he jokes. The Wise Wall Project by Project FUEL is an unprecedented way to shed light on issues crippling some of the most remote areas of the country. It started with a place called Saur, a ‘ghost village’, as it were, for out of the 200 families previously living in it, only 12 remained. A victim of mass migration because of the poor living conditions, Saur was teetering on the verge of collapse. A desire to prevent this, and to bring back a sense of community for the people left behind, is what gave birth to the Wise Wall project. Ramola saw the opportunity to do something meaningful and sought out support from DueNorth, an NGO that was already working with multiple villages in the region. Together, they set out on a unique journey that would turn out to be an incredible way to garner attention and make a difference. 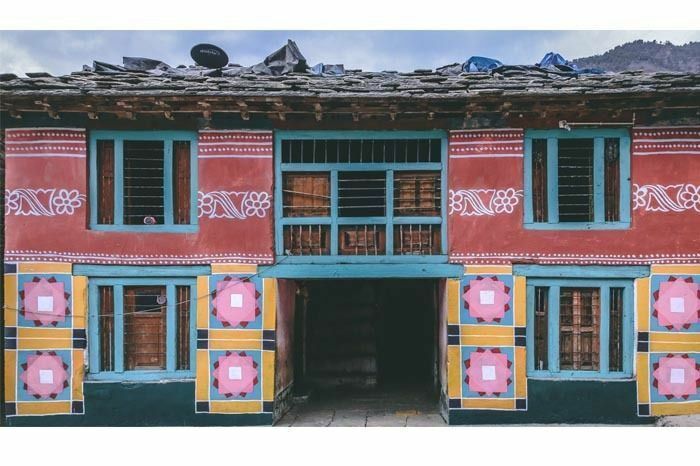 The Wise Wall Project encompasses collecting and documenting the life stories, or lessons, from the villagers and then painting them out on the walls of all the houses of the villages, essentially turning the whole village into a storybook that tells the story of its people. Saur received an overwhelmingly positive response, so much so that they ended up organising an entire festival in the village, celebrating its community and culture. When Ramola got the chance to do it all over again in a remote village tucked in the Himalayas, he grabbed at it. Khati is an isolated village in Uttarakhand, rendered almost inaccessible without any proper road connecting it to the outside world, let alone basic virtual connectivity via telephone lines or the Internet. One important feature catapulted the village into Ramola’s line of action. It is the last village on the trail to the Pindari glacier, which means a lot of people actually pass through it, even though they hardly make note of it. But this possibility of garnering mass visibility set things in motion for Khati and Project FUEL. The Hans Foundation, a charitable trust fund that provides an endowment for not-for-profit organisations operating in India, was already running an integrated development program in the region around Khati - a total of eight villages divided into hamlets, scattered throughout the ranges. Deepak relays how Khati chose them, instead of it being the other way round. The only village out of the eight to exist in a cluster of houses together, as opposed to the sparsely spread out infrastructure of the others, Khati made it possible for them to ensure visibility and impact. With the help of the Hans Foundation, the Wise Wall Project team set out for the village, which involved train journeys, taxis and ultimately trekking to reach it. Founded by Mr Manoj Bharghava, and with around 30 NGO partners, the Hans Foundation consistently works across sectors, focusing on disability, healthcare, livelihood, and education. “Khati was a benchmark project for us,” says Mr Dinesh Menaria, project manager from Hans Foundation. As one of the remotest villages of Uttarakhand, the aim was to put Khati on a platform that would make it hard for the government to continue being blind to the needs of its people. The Wise Wall project, along with the Hans Foundation, had very specific goals in mind in accordance with the larger change they wished to bring about in the region. Some immediate concerns were the lack of connectivity - both physical and virtual - that was proving to be the main hurdle on the road to progress for Khati. They hope that by highlighting the village and garnering social visibility, basic amenities like infrastructure, telephone lines, and healthcare would be made available to the villagers. 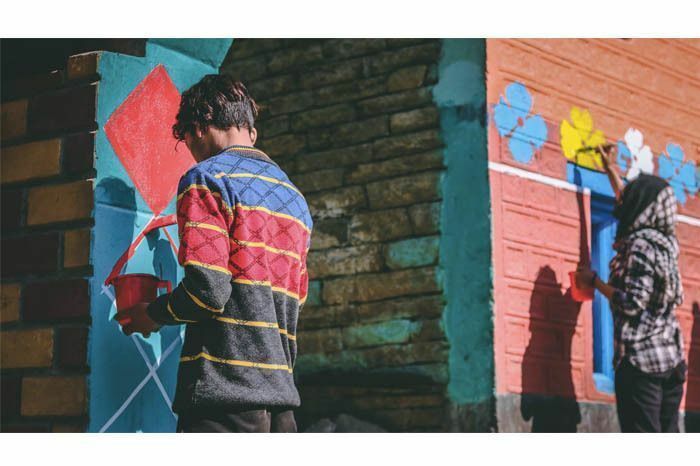 When Deepak and his team first arrived in Khati and announced their plans to turn the village into a literal canvas on which they would paint illustrations inspired from the life stories of the villagers, the response they got was overwhelming. The villagers were overjoyed and enthusiastic about joining in the process. Unaccustomed to the lack of bias shown for their socio-economic strata or religious sentiment by the Wise Wall team, they shared their stories with zeal. Deepak explains the difference between the first Wise Wall Project in Saur and this one in Khati, saying, “Saur was basically a ghost village with only 12 families residing in it. Khati, on the other hand, was a fully inhabited, albeit remote, village with a population of about 400-500.” This made for some unforeseen issues on the execution front as every one of them had an opinion about the paintings. Bringing the villagers to a consensus was crucial, but once achieved, made the entire process that much better. 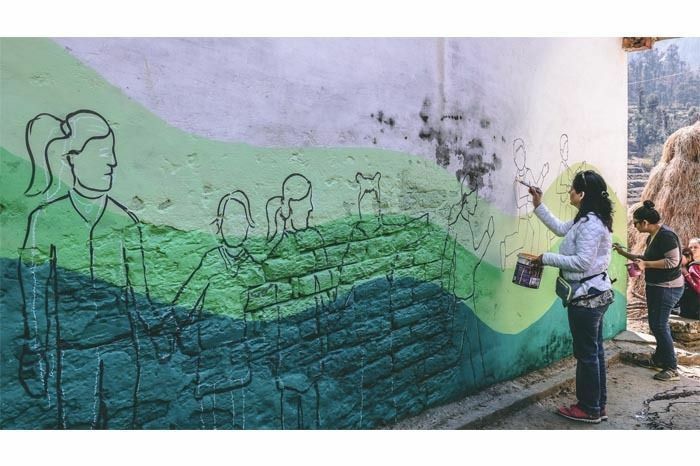 There was active community participation, with the Wise Wall Project team adopting an inclusive approach that involved sitting down with people to decide what will, and what won’t, end up on the walls of their houses. The Art Director for the Wise Wall project, Poornima Sukumar is a celebrated painter and muralist who is currently working with transgender women painting in public places. She explains how the process of painting was undertaken in Khati, especially by incorporating the Kumaoni art form - an art practice native to the region - and using it to depict instances from stories told by the villagers. Each painting has a meaning behind it. She relays the story behind one of the paintings: legend has it, the great grandfather-in-law of a lady living in one of the houses once fought and ‘elbowed’ a tiger to death. 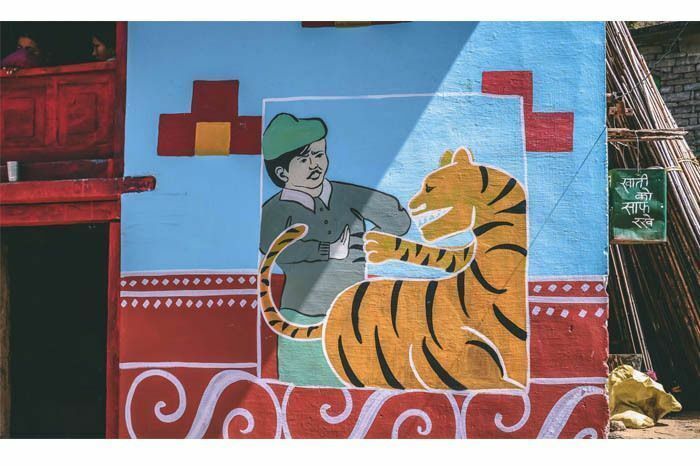 True or not, it’s a story of significance for the woman, and Poornima was more than happy to paint an entire outer wall of her house depicting the glorious combat between a man and a tiger. It’s one of her favourite paintings, though she doesn’t usually play favourites, she adds laughingly. Deepak also shares the story of a particular painting and the impact it had on him. While documenting the villagers’ life lessons, they came across a young girl of 22 named Hema. She was curious, intelligent, and more than anything, open to learning. Recently married, Hema had moved into her in-laws’ house on one condition - they will let her work. She was proficient at stitching and knew how to operate a computer, which led her to open a small tailoring shop in the confines of her house. The advantage of this was twofold - a young girl claiming her independence and sense of identity, while single-handedly solving the village’s problem of the dearth of any kind of clothing supplies in the vicinity. In a gesture honouring her story and determination, the Wise Wall project team painted a sewing machine on the wall of her house, captioning it ‘Hema Tailoring House’. With all the efforts put in the project, it is imperative that the remote village of Khati gets access to the resources so important in achieving a healthy standard of life. Ramola and the team together work not only to bring colour and beautiful art into the homes and lives of a community but revive it from the ground up with a breath of fresh air, putting it on the map, as it deserves. To get involved with the work of Project FUEL click here and to make a contribution to the Hans Foundation by clicking here.